Are you looking for some “tricks” to use in your classroom to help with getting your students involved? 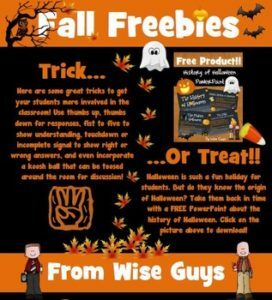 How about a “treat” of a free 7 slide History of Halloween PowerPoint? And the biggest “treat” of them all, be on the lookout for a FREE Fall eBook filled with FREE goodies from Upper Elementary Snapshots! Go to your My Purchases page. Beside each purchase you’ll see a Provide Feedback button, click it and you will be taken to a page where you can leave a quick rating and a short comment about the product. Why is feedback so important? Each time you provide feedback, you’ll earn TPT credits that can be applied to future purchases to save you money! Plus, the feedback you provide helps us make my products better suit your needs! Click the green star beside our name at the top of this page OR at the top of our store page. Following us notifies you when we post a new item and you will receive customized email updates about our store.